The Staten Island Advocate reports that members of the Unitarian Church of Staten Island (UCSI) are continuing the church’s tradition of promoting a love of books and the free exchange of ideas by opening up a Little Free Library in the church’s front yard. The idea reportedly appealed to the church’s service project group because the UCSI building once housed the first public library on Staten Island. While the UCSI’s Little Free Library is the first on Staten Island, the idea has become a worldwide book-sharing and social movement. 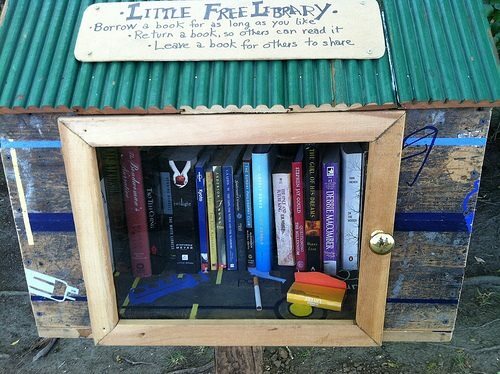 Little Free Libraries resemble a large birdhouse or mailbox, but surprisingly, they contain free books. Placed around neighborhoods, usually in volunteers’ front yards, the Little Free Library aims to inspire the community to share books, to promote literacy, and to further the love of reading. The program took off in 2009 when a former business consultant, Ted Bol, opened up a dispensary and invited those passing by to “take a book, return a book.” The program was a tribute to Bol’s mother, a teacher and book-lover. Bol put up a miniature version of a one-room schoolhouse on a post outside his Hudson, Wisc. home and filled it with books, then invited his neighbors to borrow them. They loved it and began dropping by so often that it turned into a community gathering spot. Word quickly spread through Wisconsin and the founders formed a nonprofit group. Today, Little Free Libraries number in the thousands and have been spotted in at least 36 countries and as far away as Afghanistan. There are no due dates, late fees, or library cards required, and the doors are open every day of the week. Collections can be themed, including books for adults or children, or both. Fans of the effort describe the movement as a simple and beautiful way to connect with others. With their quirky designs, the boxes are fun and children love them, and they may be easier to access than getting to the library for some people. The idea is not meant to replace public libraries. Rather, it is intended to enhance a community’s library services as a further inducement to read and an effort to promote literacy. Participants have reported surprisingly few thefts or acts of vandalism. Bol and a friend, Rick Brooks, run the project from a workshop in an industrial building near Hudson, a riverside community about 20 miles east of St. Paul, Minn. They build the boxes in a variety of styles, decorate them in a whimsical fashion, and offer them for sale on the group’s website, which also offers plans for building your own. The Little Free Libraries organization requires the participation of many volunteers to build the boxes, to host them, and to act as community stewards. Most of the nonprofit’s money comes from the sale of the pre-built little libraries, which cost from $250 to $600, and a $25 fee to register a library on the organization’s website. The AARP Foundation has also provided a $70,000 grant as part of a new program to provide book boxes for seniors. Bol and Brooks just recently began drawing paychecks after several years of working on the project as volunteers. The idea has caught on in the education world and with larger social service organizations. In Minneapolis, school officials are aiming to put up about 100 boxes in neighborhoods where many kids don’t have books at home and Little Free Libraries is working with the Rotary Club and Books for Africa to use the book boxes in its literacy efforts in Ghana.